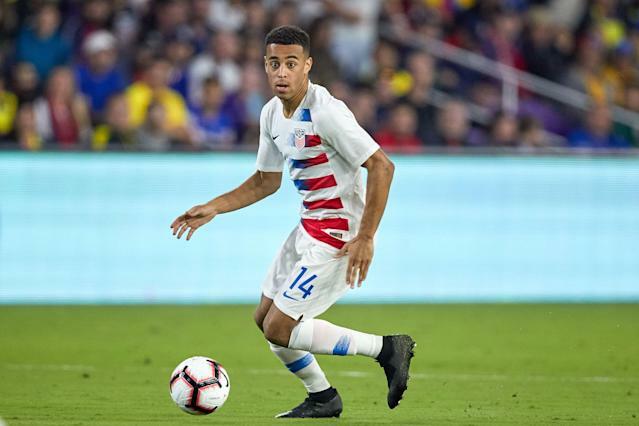 The morning after an encouraging win over Ecuador, U.S. Soccer revealed Friday that Tyler Adams has departed camp to return to RB Leipzig in Germany. Adams started at right back and played the full 90 minutes in Orlando, acquitting himself well amid the soccer community questioning Gregg Berhalter’s decision to play him there. Some expected Adams to play central midfield, where he’s been excelling in the Bundesliga since January, but Berhalter’s system provides fullbacks more opportunity to pinch in and get forward than others, and he didn’t want to shackle Adams with a pure holding role if he wasn’t going to occupy one of the “dual No. 10” spots in the attack. Those instead went to Christian Pulisic and Weston McKennie, who also made the news cycle on Friday. U.S. Soccer announced that McKennie, who was substituted off with an ankle injury against Ecuador, will travel with the team to Houston for further evaluation. It doesn’t seem likely McKennie will play against reigning South American champion Chile in Tuesday’s friendly, so the hubbub over his and Adams’ positions under Berhalter seems to have ended almost as soon as it started. Besides, Adams was effective at fullback, where he starred for the New York Red Bulls before moving to Germany. Adams was part of a back line that yielded just one shot all match and none on goal. The only other move U.S. Soccer announced was that goalkeeper Jesse Gonzalez will return to FC Dallas and be available to play Saturday against the Colorado Rapids. He’ll return to camp after the game, and no additional roster moves will be made.